A couple of weeks ago, my husband and I went camping to Big Sur, one of our favorite places on Earth! We went to the same campground we used to go when we lived in Santa Barbara: Kirk Creek. The campground is an even drive from both Santa Barbara and San Francisco. Even though we had been there before a couple of times, this particular time was special because we were bringing our new dog, Bomber, with us. Not only was this Bomber’s first time camping, but it was also our first time camping with a dog, our dog. The weekend looked great, there was no rain in sight—I guess it was all being saved for last week and this week—and temperatures in the upper 60s. As we planned our weekend of fun, we knew that it all really depended on whether Bomber liked camping or not. We were really hopeful he would. After all, so far he had proven to be the perfect dog for us! Part of my own personal plans for the weekend also included taking photographs of the area of Big Sur north of Kirk Creek. 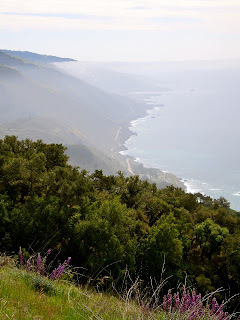 About 5 years ago, we drove all the Big Sur stretch of Highway 1, but I just could not remember much of the second half of it, the half north of Kirk Creek. Sometimes I wonder if I pay enough attention to my surroundings when I find myself in a new situation. Maybe I need to get better at it. That’s when taking photos becomes such a handy tool for storing memories somewhere other than my brain! This time, on my photographer’s radar was the Bixby Bridge, a very picturesque concrete bridge built in 1932, a landmark along the way I had totally forgotten existed! The drive down to Kirk Creek was a bit painful: We left late in the afternoon and Bomber, our dog, whined the entire 5 hours it took us to get to the campground. We arrived to our destination quite tired and ready to set up tent and call it a night, but our plans were disrupted by the fact that our campsite was taken! This had never happened to us before. We went to talk to the Ranger and he told us that the night before there had been a windstorm and the reservation tags had flown away and that ours probably got confused. I was outraged and, of course, Joe was totally calm. He talked to the Ranger, who set us up on a different site and told us we could switch the next day. And that’s as far as the complications went, as the rest of the weekend was perfect. Bomber absolutely loved camping. How could he not? He got to spend the entire day out in nature. He saw squirrels for the first time and a dozen type of birds he had never seen before. In the evening, he slept on his bed by the fire, covered entirely by his blanket. When it came time to go to bed, he ran happily to the tent and snuggled with us. He was such a big joyful presence, and we didn’t have to change anything about our camping routine. We still went on a 10-mile hike in the mountains, still hung out at the beach to get some Vitamin D, and we did lots of hanging out at the campsite, relaxing and enjoying fires. It was a happy weekend, and I think there is nothing more inspirational than happiness. Life looks better when you are happy. Everything is brighter when you are enjoying yourself, and I was able to see that in the pictures I took over the 3 days of camping. If you have been to Big Sur, you know the incredibly strong feeling of being close to Mother Earth in this little stretch of coast between the roaring Pacific Ocean and the Santa Lucia Mountains. In every bend of the mountains there is a canyon and, in every canyon, there are redwoods. Any trail that takes you up the mountains has the most impressive views you’ve ever dreamt of. My husband and I have talked about how Highway 1 actually makes the scenery more charming, and about how it allows you to get some perspective as to how enormous everything around you is. I think it’s good to think about how small we are in comparison to our world and what’s in it. It helps be you be a bit more humble. To me, it is very important to escape to nature every so often. I tend to crave the smell of trees and the feeling of walking in an environment that has not been touched by humans. I find it soothing, and Big Sur sure has what I need to get my fix of Nature! Anyway, I took lots of pictures, over 200 hundred. A lot of them are of Bomber—I had to record his first camping trip—but I have many more that attempt to capture the beauty and grandiosity of the place. 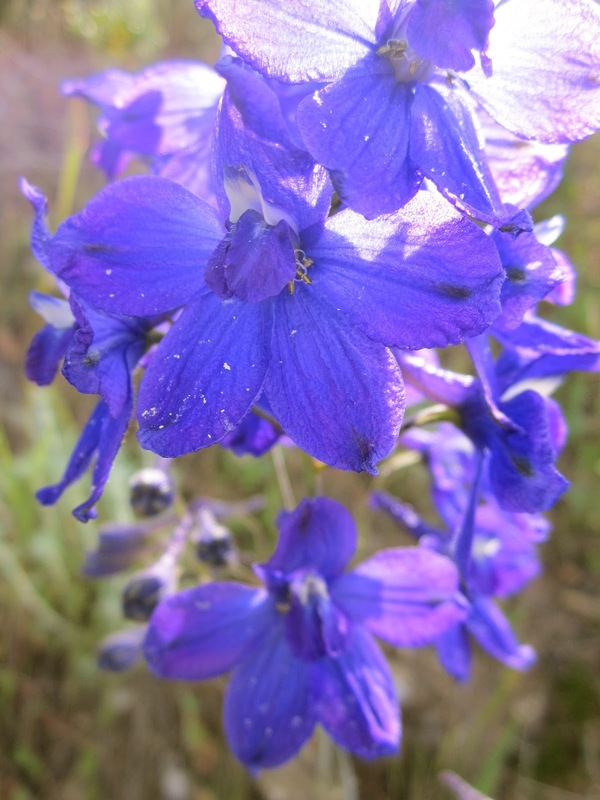 Oh!, and, as if the usual beauty of the place were not enough, we were there when flowers were blooming! The mountains were painted in purple, red, orange, yellow and white! It was magical! Look at some of the pictures I’ve posted here, or visit my Etsy store to see more. What inspired me over the past weekend? The answer is simple: I was inspired by the simple, but yet intricate, beauty of nature; by the smell of fresh air; by being with my husband all day long for 3 days; and by Bomber’s excitement of having discovered the wilderness for the first time in his puppy life! Do you ever wonder where your life is going? Do you ever wonder if you are doing the right thing? Going the right way? I know I do. In fact, for the past 2 years, after having completed my Master’s in Public Health, that’s pretty much all I have done. As a new professional at the entry level with limited work experience—though lots of volunteer and life experience—I found it very challenging to get job in the midst of one of the worst economic crises. To make matters worse, funding for the causes I am interested in is constantly being cut. On top of all of these circumstances, my husband and I decided to move from Minnesota to California after we finished graduate school, and I was faced with having to start a network from scratch. We spent our first year in the West in Santa Barbara while my husband clerked for a federal judge there. Having to find a job for just a year posed a big challenge. Following my idealism, I decided to sign up to be a reading tutor with the local AmeriCorps chapter. I know some people who have been involved with AmeriCorps, but I don’t think I know anybody who had the terribly bad experience I had with them. To be fair, all chapters are run differently, so some are better than others. Let’s just say that the Santa Barbara chapter is not the best example of what the program can do, or of how it could be operated. In short, I lasted a painful 4 months working as a reading tutor and quit after that… Now I only had 8 months left in Santa Barbara, which made looking for a job even more challenging. Once again, I was faced with the future, with choices, and I was challenged by my own expectations. It was shortly after the New Year rolled in that I came across the United Nations Online Volunteering Opportunities while looking for something meaningful to do with the time I had left in Santa Barbara. In this site I found a great opportunity to volunteer with Delta Women, a Nigerian NGO fighting for the rights of women. For the next 8 months, I worked arduously with Delta Women, doing whatever I could to contribute to their cause! It was during this time that I finally felt satisfied with my day to day. My work with Delta Women gave me a sense of purpose and kept me motivated. After 8 months, in August, my husband’s clerkship came to an end and, once again, we packed our bags and our apartment, and set out. This time we were not moving immediately, but we were embarking on a 3-month trip around the world, a much-anticipated adventure that had been in the making for a couple of years. Due to my work with Delta Women and to our travel plans, I stopped questioning the direction my life was taking. Every once in a while I would think about jobs and about the fact that I had graduated with a master’s degree but didn’t have a job. The student loans sometimes came to haunt me, but I usually managed to push them out of my mind. Where was I going now? I wasn’t sure. As part of my post-AmeriCorps time in Santa Barbara I also got reacquainted with the arts, and I started (and finished) 3 pieces. I have always loved drawing and painting but never thought about pursuing it and, here I was, unemployed and with a lot of time in my hands… plenty of time to work on my art again. Although I had not been doing much painting or drawing, over the past few years I had developed a new interested in photography. During my time in Santa Barbara, my photographic interest bloomed even more too… if you have ever been to Santa Barbara, you would know how inspiring that place is. Scenery like this makes you forget all your worries! I didn’t think too much about my future direction while traveling. During those 3 months, I only thought about each day I started next to my soul mate. Each day was an empty page, ready to be filled with whatever we decided to so. Oh the freedom of traveling… but, once our trip came to an end, and we moved permanently to San Francisco, the questions started to invade my mind again. What was I going to do? What job was I going to get? Was I going to find a job at all? I looked, I applied, I interviewed, but I didn’t find any. About 3 months into my search, I stopped looking and I decided to do something on my own. I started thinking about my options. So, here I am now. It’s been 2 weeks since I opened my store and I have been learning lots about it. Surprisingly, it takes most of my time during the day. So far I have sold 2 photos and I’m hoping to continue to sell more. Also, while poking around Etsy I noticed that a lot of people write blogs, which brought back my desire to start one, and here I am! What is this blog going to be about? I’m not totally sure. Once again, I am faced with the questions about the future and my direction in life. This time, however, I can take this any way I want and it’s all in my own hands. I am finally following my artistic passion by showcasing my photography and by trying to do something with it. For right now, I’m happy with what I’m doing. I’ve decided to ignore societal pressure to conform to the traditional standard of getting a job, settling down, etc… At the end, what really matters, is if you met your own standards and if you were happy while doing that! We’ll see where this adventure takes me!